The Area-51’s three corners are built to support the system’s weight. Pivot the system towards you and gain easy access to the rear ports when connecting or disconnecting cables. There is even a button on the back of the chassis that turns on the rear accessibility lighting to reduce the need of having to use a flashlight. Transport your ultimate gaming rig anywhere. The rugged handles make the Area-51 more natural to carry. The shape and internal component layout are designed to have a low center of gravity to avoid the system from tipping when being lifted. The angular shape is designed to have all the I/O ports facing you directly, making connecting a USB device, headphones, or even a media card reader easier than on a traditional rectangular chassis design. Internal fans blow fresh ambient air, quietly and directly, onto the graphics cards and the internal cable management enables maximum airflow – satisfying your system’s hunger for cooler air and keeping it performing at its peak. The angled design also provides a large space for hot air to escape where a traditional, rectangular chassis only leaves a small space between it and the wall. 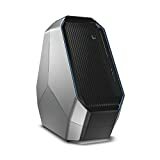 This entry was posted in Discount Computers and tagged 16GB, 3.3GHz, Alienware, Area51, Core, i75820K, Intel, Refurbished, Win10 Silver Certified by Gadgets Manual. Bookmark the permalink.